This chapter examines the question of the role of intellectual analysis and ethical judgement in ancient Indian Buddhist accounts of sati and contemporary discourses about ‘mindfulness’. Attention is paid to the role of paññā (Sanskrit: prajñā: ‘wisdom’ or ‘analytical insight’) and ethical reflection in the cultivation of sati in mainstream Abhidharma and early Mahāyāna philosophical discussions in India, noting the existence of a subordinate strand of Buddhist thought which focuses upon the non-conceptuality of final awakening (bodhi) and the quiescence of mind. Modern discourses of mindfulness are examined in relation to detraditionalization, the global spread of capitalism and widespread adoption of new information technologies. It is argued that analysis of the exponential growth in popularity of ‘mindfulness’ techniques must be linked to an exploration of the modern history of attention, more specifically, the possibility that the use of fast-paced, digital, multimedia technologies is facilitating a demand for fragmented or dispersed attention. 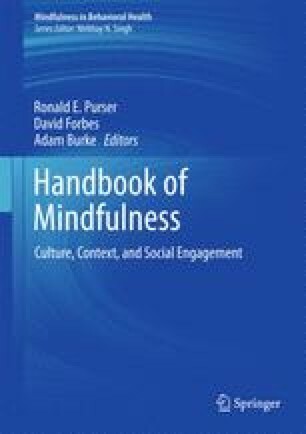 It is argued that the fault line between divergent contemporary accounts of mindfulness can be seen most clearly over the issue of the role of ethical judgements and mental ratiocination within mindfulness practice. The two most extreme versions on this spectrum see mindfulness on the one hand as a secular mental technology for calming the mind and reducing stress and discomfort, and on the other as a deeply ethical and experiential realization of the geopolitics of human experience. These, it is suggested, constitute an emerging discursive split in accounts of mindfulness reflective of divergent responses to the social, economic, political and technological changes occurring in relation to the global spread of neoliberal forms of capitalism. Morris, N. (2010, October 2) Fully experiencing the present: A practice for everyone, religious or not, Los Angeles times. http://articles.latimes.com/2010/oct/02/local/la-me-1002-beliefs-meditation-20101002. Accessed January 4, 2016.